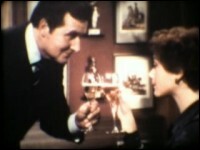 Steed is about to offer some champagne to Tara. "As I was saying, my dear, Laurent-Perrier is a champagne that—" and at this moment, a small gang of thugs bursts into his flat. "You were expecting someone?" As Steed casually uncorks the bottle, Tara engages all three of their foes, making use of Steed's brolly in the process. "Don't be mad at me if I review the details of the party. As you see, my dear, Laurent-Perrier champagne must be drunk at the correct temperature, fresh but not frozen—in a way, frizzled. Served between seven and eight degrees..." One of the men lands unconscious at Steed's feet, and he casually steps over him to offer a glass Tara, who resumes her place in the chair just in time. "...and especially in a strict, intimate setting." They clink glasses. "I hope you're not expecting anyone else tonight?" What a priceless gem! A petite morsel of Avengers from a time when nothing of the series existed. Laurent-Perrier spared no expense to make this sixty-second "episode" authentic, from the stunningly detailed facsimile of Steed's flat to Tara's on-the-mark wardrobe. Not to mention Steed's dry wit and the classic fight sequence—all captured in over thirty shots, including a title card and a split-screen "tag." Would that it could be in English! But it would appear that Macnee speaks in French (which is dubbed), and in a strange Rhonda-esque twist, Linda does not utter a syllable. The only ding against this tiny treasure is the rather flaccid, decidedly un-Avengers music score. A second commercial was produced using the same visuals but with Spanish dialogue and music with strong stereotypical French character. Oh, and it sure looks like one of the three thugs is Joe Dunne.